81 degrees north, 12 degrees east; an easterly ground swell of 0.5m is running and the fragmented pack ice is undulating gently. To the south lies the fog bank through which we just sailed, visibility within dropping below 50m. The sky is blue but there is no warmth in the Sun. There is an eerie feeling of emptiness this high north. The only sound we hear is the crackling of the ice, the humming of our generators and the roaring stillness of the Arctic. Our world is void of smell and colour; a monochrome world, with a blueish tint and a freshness in the air that numbs your nostrils. We have not seen vapour trails of aircraft for days, and have only seen one other boat two days ago. Yet we are not alone. Having pushed through a 100m-wide belt of fragmented first-year ice, we shut down the engines and drift in open 2,200m-deep water, less than 1,000km from the North Pole. Two cables to the north, the pack ice stretches as far as we can see; too dense, hard and thick for Kamalaya to enter. The uniform surface of the pack ice is only broken by shards of ice having calved from some unnamed glacier somewhere to the east, possibly from the White Island Glacier, where the Andrée Expedition so tragically ended with the death of its three members in 1897. Through the fog bank the ghostly outline of Havsel appears. A sturdy 35m ice classed sealer that can break ice of up to 0.75m thick is accompanying us on our trip into the ice, in our search for polar bears. I step outside onto the bridge wing. Good Lord, it is cold. I hate the cold. 0 degrees celsius air temp and minus-one degree celsius water temperature. Thank God there is no wind to speak of. More than half my life I have lived in the tropics. At the age of eight, just having returned from Africa, my only early childhood memories of Germany being warm balmy summer days, I managed to fall into a creek. By the time I was home I was half frozen to death, and I swore to leave this miserable cold country the moment I was old enough to make my own decisions. The day after I finished school I joined the merchant navy and quickly learned to hate the cold North and Baltic seas, and it was only a short time before I ended up running yachts in Southeast Asia. How did I manage to end up here at 81 degrees north? The answer, I suppose, is quite straight forward: in search of adventure. In search of places we do not have to share with crowds. In search of the wonders of the world that are only accessible to those fortunate enough to have a boat. The owner's brief was simple: let’s go to some place with a spectacular landscape. The owner's brief was simple: let’s go to some place with a spectacular landscape. “What do you think of Norway, Captain?” It certainly sounded attractive, and when I suggested that we push north to Svalbard, a mere 500 miles north of Norway, the owner enthusiastically agreed. The prospect of seeing polar bears in the wild was simply too tempting to pass up. 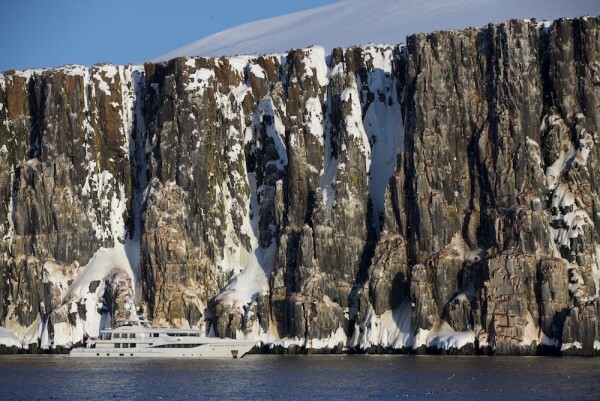 Svalbard is probably the one destination in the Arctic that is quite accessible to your average yacht. Once in Northern European waters, it is essentially coastal sailing bar the 500-mile open ocean passage from Tromso. Even on this stretch, a port of refuge is available with Bear Island, offering limited protection at about halfway distance. The west coast of Svalbard is pretty much ice-free all year round. The Gulf Stream can still be felt this far north, and even during the coldest winter months, the approaches to Longyearbyen, the capital of Svalbard, remain accessible. Kamalaya is a standard Amels LE180 55m motor yacht, and not ice classed. This was our second trip into polar waters and, again, we encountered no issues with the boat, except for the sun deck ice maker breaking down once we passed 79 degrees north; a problem that my crew managed to deal with in a professional manner - a chain saw and a growler. Wanting to push into the ice this time round, we considered it prudent to have a support vessel. Henry Cookson Adventures (HCA) introduced us to Jason Roberts of JR Productions (JRP). Jason has lived in Svalbard for 26 years and was involved in the production of well-known films such as the BBC's Planet Earth Ice Worlds, Frozen Planet and The Hunt. JRP provided logistical support. Through JRP, we charted the ice breaker Havsel, run by owner-captain Bjørne Kvernmo, who has sailed his entire career in the polar seas. 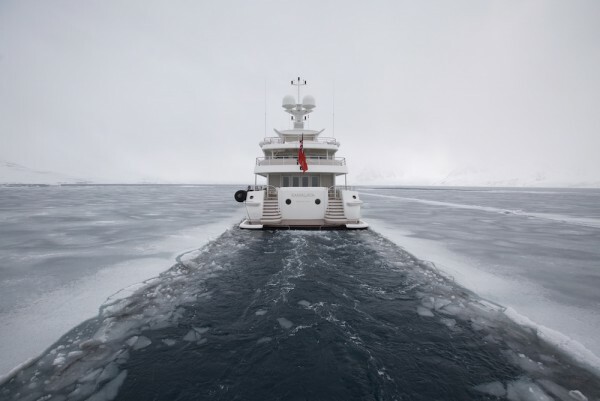 Also on board were arctic guides Oskar Strøm and Einar Elissen; both worked with Jason on the BBC productions and numerous other projects, and Geordie Mackay-Lewis of HCA. Having Havsel at our side added not only a huge amount of local knowledge to our trip, but also peace of mind. Whenever the ice got too thick Havsel paved the way for us. Many of my colleagues have wondered on what impact the ice had on our paint and antifouling, and I am happy to report that the antifouling is still in place and there is not a single scratch on the paint. Many of my colleagues have wondered on what impact the ice had on our paint and antifouling, and I am happy to report that the antifouling is still in place and there is not a single scratch on the paint. Going through the open ice we did have the odd contact with a growler but nothing out of the ordinary, and quite comparable to the thumps one experiences when operating in the Amazon or along the coast of Borneo, where one encounters quite large trees that are often hidden just below the surface. Incidentally, it is prudent to look out for large logs in the water around Svalbard; the aptly named Woodfjorden is packed with drift wood washed out to sea from the Siberian rivers. Besides breaking ice, the Havsel also brought along her snowmobiles. Having broken into the fast ice, the snowmobiles were launched and gave our guests the added mobility to explore the vast expanses of the frozen world. Much to their delight, this paid off on the very first day the snowmobiles were used. Some 10km from the boat, the group came upon a bear with her cubs feeding on a freshly killed seal. Even with 24 hours of daylight, and little sleep, we only managed to scratch the surface of what there is to see and experience in Svalbard. Being very early in the year, we missed out on belugas and narwhales. We did not dive with the guillemots under the bird cliffs or snorkel with the humpback whales. After seven days and 750 miles sailed around the archipelago, we returned to Longyearbyen to see off our guests. Everyone on board felt sad that this epic voyage at the top of the world had gone by like a blur. While I still prefer the warm weather to the polar temperatures, I must admit that the frozen world has totally enchanted me and I am looking forward to more adventures in the high north or the deep south. There are plenty of destinations to visit, and you do not need a specially equipped exploration yacht. More than anything else, the will of the owner and the crew to go places dictates just what you can do with your yacht. Don't miss our article on Polar Code training for crew in issue 79 of The Crew Report - pick up your copy at the Monaco Yacht Show.